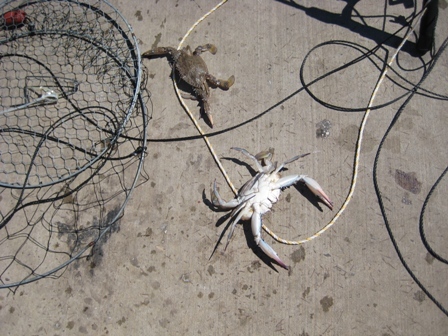 Most fishing experts claim that it’s best to go crabbing during the months with a “r” in it here in South Australia although crabs can supposedly be caught all year round. Judging by our crabbing luck, I believe in the fishermen’s advice. Blue Swimmer (Portunus pelagicus) crabs are the species that everyone here looks for – they are small compared to the Dungeness crabs (Cancer magister) that I was used to in San Francisco and all up the Pacific Northwest but they are still very tasty. The meat is sweet and delicate and is very tasty when tossed with some pasta, olive oil, garlic, chillies and freshly grated Parmesan. Although you can buy crabs in the markets here, it is so much more fun and rewarding when you go through the effort of catching them yourselves. I also believe that if you find food growing in unexpected places such as on a tree, growing wild by the side of the highway or digging up clams on a beach that you never even been to before, the sheer excitement of finding food either by fishing or simply stumbling upon it in unexpected places makes me giddy like a small child. You will hear of many entries where I search for food in my neighbourhood or while on my many road trips. Bon appetite!